The Whiting Forest of Dow Gardens is very pleased to announce that it is holding a birding festival this coming 19-22 September, 2019 with events around Midland, speakers and informational sessions, field trips, workshops, and more! Photography (and birding) Opportunity on Isle Royale! Kathy Bricker covers the special adaptations of birds of prey along with information about their ecology, diversity, identification, population levels, migration, and conservation, interspersed with personal stories. The program welcomes people to visit the research and observation sites near Cheboygan, Mackinaw City, and St. Ignace, and to enjoy the annual April event in Mackinaw City, the Mackinac Raptor Fest.www.mackinacraptorwatch.org. It's that time of year when warblers will be migrating north again. Roger Erikkson will show a series of his photographs that detail the key field markings for most of the 37 warbler species that nest or migrate through Michigan. These photos will include male, female and juveniles in their spring and fall plumages. Come ready to learn new identification tips. Duck Stamps - Allan Theile sent along this link to learn about duck stamps you can purchase and how the money is used to buy land for national wildlife refuges. Thu April 20 12 noon public program by Michael Stoner: Selections form Pinconning Journal "Birding Bits" articles - at Pinconning High School Media Center. Thu April 27 12 noon public program by Dale Borske: Ducks Unlimited's Role in Preserving, Enhancing, and Protecting Wetlands in the Saginaw Bay Region - at Pinconning High School Media Center. Thu April 27 3pm Tours of Pinconning and Standish Nature Preserves by Saginaw Basin Land Conservancy staff - meet at preserve entrance on Pinconning & Maloney Roads. Wed May 3 9am - Tour of Nayanquing Point State Wildlife Area by Ducks Unlimited and DNR staff - meet at DNR office on Tower Beach & Kitchen Roads. Thu May 4 12 noon - public program by Sam Burkhardt: Saginaw Bay Birding Opportunities through the eyes of a newcomer - at Pinconning High School Media Center. Mon May 8 8am - morning walking tour of Pinconning County Park by birder Joe Soehnel - meet at park gazebo, end of Pinconning Road, $3 entry fee. Tue May 9 6:45pm - evening walking tour of Pinconning County Park by Rotary Club members - meet at park gazebo, end of Pinconning Road, $3 entry fee. Pinconning High School Media Center. Summary: A total of 121 species from the Michigan Bird List were reported this winter. While below last winter’s all time record, this number is still above the long-term average, the fourteenth consecutive year that this has occurred. This report lists all of the species reported, along with the highest reported individual count for each, and a list of the SBA counties in which each was noted. The species order of listing has changed this period, so as to remain consistent with the MBRC Michigan Checklist, which was updated 26 Nov 2016, based upon the AOU Check -list of North American Birds (7th ed.) and its supplements. Overall, observer coverage could be rated as average, and sufficient in terms of county and species representation. Winter may be the season with prevailing bird life most routinely influenced by weather. Overall, winter 2016-2017 temperatures were much above average in Michigan (7th warmest out of 122 years). As the National Weather Service daily plots for Saginaw at the tail end of this report illustrate, December started out above average before dropping to below mid-month, then rebounded to middle / middle high. January’s temps went through several of the radical bounces to the extreme. February’s average temperature was much above normal, (it was the 2nd highest average February for the U.S. as a whole, at 41.16F, eclipsed only by February 1930, at 41.41F, (but note that 2017 was only 5 degrees above trend, whereas 1930 was 7.5 degrees above trend). While above average February temperatures didn’t noticeably influence all species, it did account for widespread early arrival of waterfowl and blackbirds to the SBA, as well as two new SBA spring early arrival dates. Seasonal snowfall totals for Saginaw were below average, but the precipitation story doesn’t end there, because there was an above average amount of rain, (indeed more days of rain than of snow). Click HERE to view complete report! Meeting at Green Point Environmental Learning Center, Saginaw, MI. The Great Lakes Region's largest wetland restoration in 70 years is taking place at Shiawassee National Wildlife Refuge in Saginaw County. Join Visitor Services Manager, Lionel D. Grant as he enlightens you on the path the Refuge has taken to convert over 700 acres of former farmland into suitable waterfowl habitat. Shiawassee Refuge is also working on turning the former Germania golf course into another natural space that can be enjoyed by the community, adjacent to Green Point ELC. Refreshments and meeting announcements follow the presentation. For more information contact Larry at 989-777-4787. 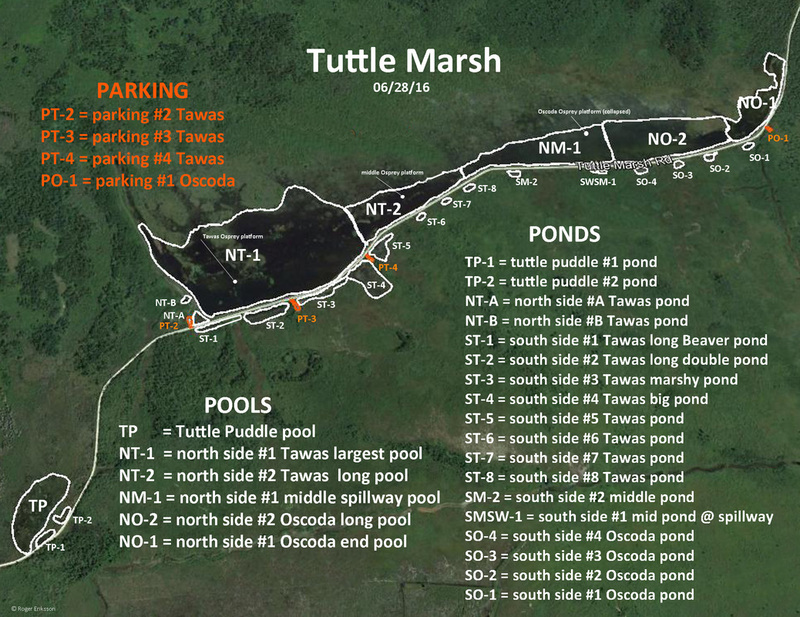 Roger Eriksson has taken the time to code all areas of Tuttle Marsh. This is a very large and vibrant marsh in Iosco County that has had 229 species observed over the years, according to eBird. The best species, by far, was a Purple Gallinule found there on two separate years, 2010 & 2014. Tri Colored Heron and Whimbrel have been observed there in the past week (Labor Day weekend 2016). Please consider using this coded map when reporting uncommon birds at Tuttle Marsh. This will clearly help birders track down the next uncommon bird that will surely be found at Tuttle Marsh. Thanks, Roger, for this coded map!! A total of 189 species from the Michigan Bird List were reported in the Saginaw Bay Area this summer. This falls short of the last two summer’s unusually high totals, but it is still above the long term average for the season. This report lists each of the species reported, along with the highest reported individual count(s) for each, and a list of the SBA counties in which each was noted. Last departure dates and first arrival dates are listed for species that aren’t present during the breeding season. As is typical for the season, the total number of observers and observer trips was on the low side. Arenac County was comparatively under-represented. Only one Michigan Review List species was reported. One new SBA peak count was established. June temperatures were seldom above or below the mean deviation. July was similar, but a bit more often above average. The later half of July was notable for lack of precipitation. ​Click here for complete survey! Chimney Swifts at Chestnut Hill Elementary School, 3900 Chestnut Hill Drive, Midland MI 48642. July 28, 2016. At least 100+ birds. Very hard to count in the dim light with them circling. Saw the first pair of swifts arrive in the area at 9:01. By 9:19 lots of birds making fakes toward the chimney but veering off rather than going in. At 9:21 a few more went in. At 9:23 came the big dump-all the birds went in-or almost all. 9:25 one bird in and I could not hear or see any more. Waited a few minutes and saw no more. Instead of one big dump with a few stragglers, there was a big flock into the chimney and then about 1/4 of them came in over the next 5 minutes. Arrived at 9:10-birds were flying in circles over and around the chimney. Staked out the school at 5:00 AM. Had a long wait.Had been there at 6:00 AM July 29th and saw no birds so I moved it up an hour. Waited 10 minutes but saw no more birds. As they left they immediately left the area, no clouds of birds like the arrival. Left two or tree at a time. Easy to count, unlike their arrival in one massive dump. I may have missed a few because they come out of the chimney, drop over the lip and glide away. A few might have sneaked by on the back side of the chimney. ​Winter ignored the calendar as March began, issuing a major snow event on the first full night of March. Another decent snow occurred later in the month, along with some rain, but from mid-April on there was no more snowfall, and indeed, lower than average rainfall. March temperatures were milder than average, but April and May were near average. A total of 262 species from the Michigan Bird List were reported in the Saginaw Bay Area this spring, the third highest total since the Birds in the SBA compilation was initiated. This report lists each of these species, along with the highest reported individual count(s) for each, and a list of the SBA counties in which each was noted. First dates are listed for species not recorded in the preceding February, and last dates for (most of) the species that don’t remain into the summer. An impressive number of six new SBA all-time peak counts were established. Equally impressive were the six new spring high counts. There was one new record spring early date, and one new record spring late date. One first time ever in the SBA record was reported, as were first time records for Arenac County, Saginaw, and Tuscola Counties. Rounding out the list of notables is the seven Michigan Review List species were reported. Fish Point State Wildlife Area in Tuscola County, and Tawas Point State Park in Iosco County played a significant role in SBA birdlife this spring, accounting for many of the before mentioned records.